Jan 25, 2010 - "Rather than invest in new aircraft, Delta will be spending its capital to improve the quality and consistency of the on-board product and efficiency of the aircraft we already own." said Ed Bastian, Delta's president. Installing full flat-bed seats in BusinessElite on 90 trans-oceanic aircraft, including 14 Boeing 767-400ERs, 52 Boeing 767-300ERs, 16 Boeing 747-400s and eight Boeing 777-200ERs. Upon completion, each of these fleets will have full flat bed seats on all aircraft. Adding in-seat audio and video on demand throughout Economy Class on 16 Boeing 747-400 and 52 Boeing 767-300ER aircraft. With these additions, Delta will offer personal, in-seat entertainment for both BusinessElite and Economy class customers on all wide-body aircraft. Adding First Class cabins to 66 CRJ-700 aircraft operated by Delta Connection carriers ASA, Comair and SkyWest, bringing to 219 the number of regional aircraft with First Class seating. Completing the modification of 269 pre-merger Northwest aircraft to feature Delta's signature blue leather seats, updated lighting and enhanced cabin amenities such as increased overhead bin space on pre-merger Northwest 757-200s. Installing winglets on more than 170 Boeing 767-300ER, 757-200 and 737-800 aircraft to extend aircraft range and improve fuel efficiency by as much as five percent. Renovating and expanding Delta's Los Angeles Sky Club lounge, and introducing new Sky Club locations in Seattle, Philadelphia and Indianapolis. "Delta's planned fleet and product investments mark the most significant investment we have made in our customers in more than a decade," said Delta CEO Richard Anderson. "Our premium travelers tell us that the comfort of a flat bed seat with direct aisle access, a first class experience on regional jets and in-flight entertainment are important factors in their choice of carrier." Delta currently offers the most on-demand entertainment among U.S. carriers with more than 100 domestic aircraft equipped with in-seat audio and video on demand. 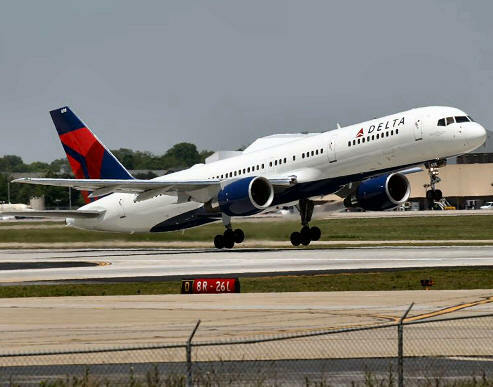 Delta also continues to rapidly expand in-flight Wi-Fi service, which is available on more than 340 aircraft and more than 1,200 flights each day. Delta, the largest operator of Wi-Fi enabled aircraft in the world, plans to have more than 530 aircraft equipped with Wi-Fi by mid-2010. Delta's upcoming fleet and product investments build on recently announced improvements including the re-launch of the Red Coat program at Delta's international hub at JFK and subsequently at all domestic hubs; the addition of BusinessElite service on Delta's transcontinental routes between New York-JFK and Los Angeles and San Francisco; the introduction of the full flat bed seats on all flights between the United States and London-Heathrow; and the announcement of plans to create a domestic hub at Delta's No. 1 business airport - New York-LaGuardia, subject to government approvals. Delta Air Lines, the world's No. 1 airline, serves more than 160 million passengers each year. Delta and the Delta Connection carriers offer service to 368 destinations in 66 countries on six continents. Delta employs more than 70,000 employees worldwide and operates a mainline fleet of nearly 800 aircraft. Delta offers customers more than 16,000 daily flights, with hubs in Amsterdam, Atlanta, Cincinnati, Detroit, Memphis, Minneapolis-St. Paul, New York-JFK, Paris-Charles de Gaulle, Salt Lake City and Tokyo-Narita.